The canine hair tissue analysis includes a comprehensive interpretation of the mineral assay performed by a federally licensed laboratory (Trace Elements, Inc.). 15 nutritional elements are measured, 8 toxic metals, 7 significant mineral ratios, 9 toxic ratios, and an additional 15 elements. 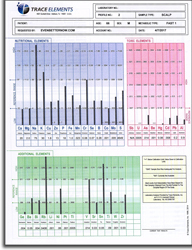 You receive a printed copy and an electronic email copy of the test results which show graphic illustrations of the levels and ratios. 6 Significant Mineral Ratios: Ca/P, Na/K, Ca/K, Zn/Cu, Na/Mg, Ca/Mg, Fe/Cu. If the relationship between certain minerals in the dog are disturbed, normal biological functions and metabolic activity can be adversely affected. An individualized evaluation and discussion of mineral patterns and their impact on chemistry are written out. Metabolic type, endocrine and performance indexes are discussed. Also, any important nutritional minerals, essential to overall health, are highlighted if there is any moderate or significant deviation from normal. Dietary supplement recommendations (by Trace Elements, Inc.) are given based solely upon hair mineral patterns determined. Please Note: If you require further interpretation of the results, we can refer you to a canine hair analysis expert, who will offer consultations at a rate of $20/quarter hour. Also Note: Please include the name of your pet in the "Additional Information" box when placing your order or contact us to let us know. This is to ensure that we can match your order and mailing address to the name on the report.